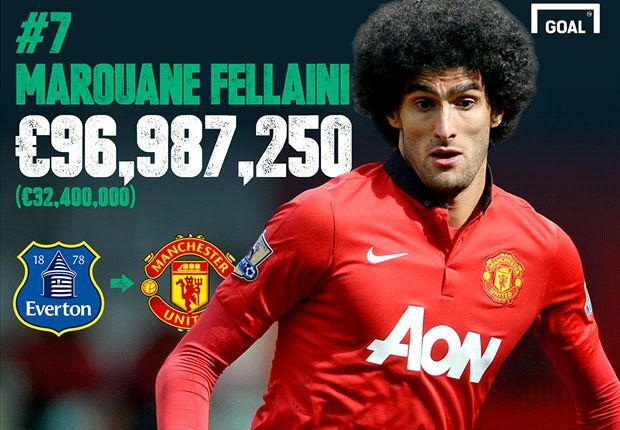 Transfer List 2013: James, Higuain, Marquinhos, Fellaini & Gotze – Hit or Miss? From a footballing perspective, 2013 will perhaps be as well remembered for Gareth Bale becoming the first €100 million footballer as Bayern Munich’s historic treble success. Real Madrid’s decision to break the transfer record to sign the Welsh winger from Tottenham made headlines the world over and his performances in the Spanish club’s famous white shirt continue to be scrutinised on a weekly basis. Therefore, on the eve of the launch of the Goal Transfer List 2014, we have decided to take a look back at the top 10 deals of last year and see how those involved have fared in interim. 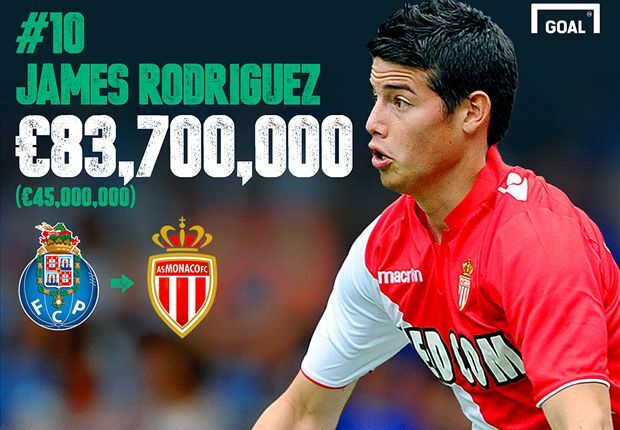 Radamel Falcao was Monaco’s statement signing of the summer of 2013, with the arrival of James Rodriguez from Porto relatively low-key by comparison – despite the €83.7m outlay (€45m transfer fee and an additional €38.7m in wages, taxes and agents’ fees). However, whereas Falcao struggled for form and fitness in France, his fellow Colombian excelled, playing a key role in Monaco’s second-place finish in their first season back in Ligue 1. Indeed, James created more goals than any other player (12) and also contributed nine himself. After achieving superstar status with his sensational goalscoring exploits at Brazil 2014, the World Cup’s Golden Boot winner joined Real Madrid for a reported €80m, allowing a suddenly prudent Monaco to make an approximate €35 million profit on a player that had helped them secure a return to the Champions League. After allowing Edinson Cavani to join Paris Saint-Germain on July 16 of last year, Napoli president Aurelio De Laurentiis knew that he needed a marquee replacement to appease his club’s concerned fans. Just 11 days later, the film producer pulled off a major coup by acquiring Gonzalo Higuain from Real Madrid. Not only did the Partenopei beat off competition from Arsenal to land the prolific Argentina international, they only also managed to sign ‘El Pipita’ for a fee of €37m. Thanks to the money earned from the Cavani deal, De Laurentiis was able to offer Higuain a contract worth €5.5m a year, which was €1m more than the Uruguayan’s annual wage at the San Paolo. Higuain has not scored at the same rate as Cavani, who averaged 0.75 goals per game in Serie A, but the River Plate product has netted 24 times in 47 games (0.51), thus establishing himself as a firm fan favourite at the San Paolo. 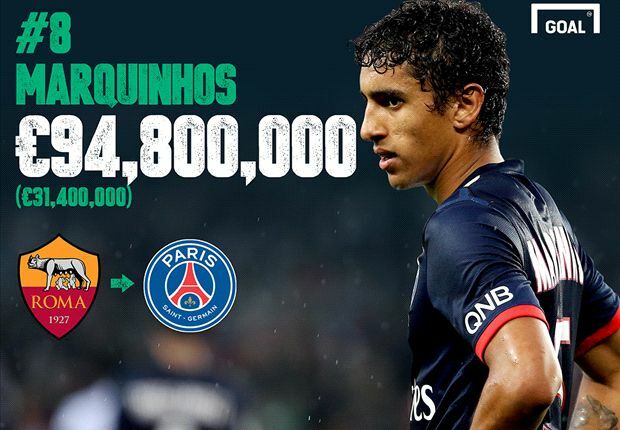 It may seem strange to say of a year in which the transfer record was broken, but Marquinhos’ move from Roma to Paris Saint-Germain was arguably the most extraordinary deal of 2013. The Brazilian’s talent is beyond dispute, having proven himself one of the classiest centre-halves in Serie A during Roma’s 2012-13 campaign. However, PSG’s decision to pay the Giallorossi €31.4m for him was utterly remarkable given he had only played a grand total of 44 professional games. In addition, the French champions handed the youngster a five-year contract that nets him €5m per year. Marquinhos has made just 33 appearances for PSG (six as a substitute), scoring three goals in the process, but has yet to nail down a regular starting berth, with the subsequent arrival of compatriot and fellow defender David Luiz from Chelsea having hindered his first-team chances. Marouane Fellaini was expected to follow David Moyes to Manchester United as soon as the former Everton boss was confirmed as Alex Ferguson’s successor at Old Trafford in the summer of 2013. However, no move materialised before the expiration of the Belgium’s €27.85m buyout clause at the end of July and the deal appeared dead. United, though, were subsequently unable to land any of their primary midfield transfer targets, resulting in a deadline-day move for Fellaini. The former Standard Liege starlet cost United just under €100m in total, with the decision to pay a transfer fee of €32.4m for a player that they could have signed just over a month previously at a reduced rate causing most consternation among the United faithful. Fellaini’s performances during his first season at Old Trafford (no goals in 21 appearances in all competitions) failed to dispel the belief that the 27-year-old had been a ‘panic buy’ but he is, at least, enjoying something of a renaissance new Red Devils boss Louis van Gaal. 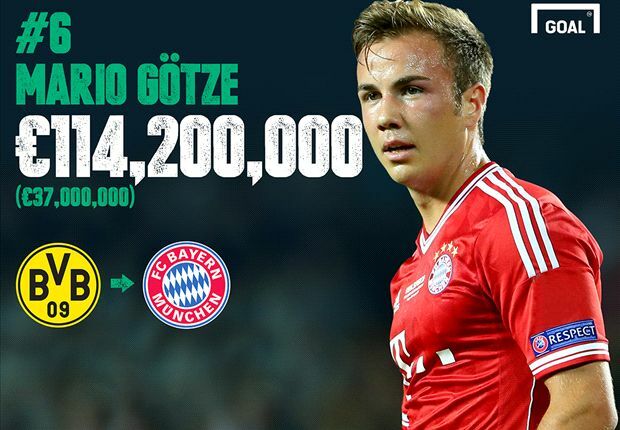 The most controversial transfer of 2013 was undoubtedly Mario Gotze’s switch from Borussia Dortmund to Bayern Munich. BVB found the loss of a precociously talented academy product to their greatest rivals tough to take, but there was nothing they could do about it, with the Bavarians having agreed to meet the Germany international’s €37m buyout clause. However, what infuriated Dortmund was the fact that the details of Gotze’s departure were leaked to the press ahead of a crucial Champions League clash with Real Madrid. BVB blamed Bayern, sparking a feud that still shows no signs of abating. While relations between the two have steadily worsened over the past 18 months, Gotze’s performances have incrementally improved. The versatile attacker may be on hefty €10m a year after tax but he has, after a slow start to his Bayern career, proven himself one of the most valuable and versatile members of Pep Guardiola’s starting XI, while at the same time underlining his status as a superstar-in-the-making with his winning goal in the final of the 2014 World Cup. This entry was posted in News on 15/12/2014 by mirsinho.